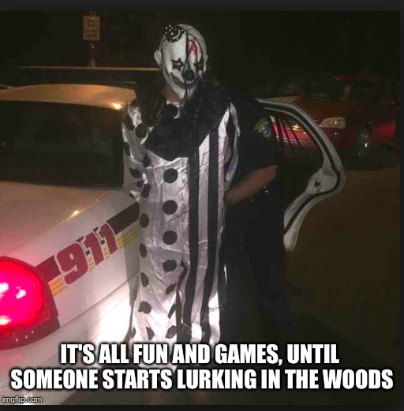 At-Large Election: what lurks in those woods? We’ve been thinking on the At-Large candidates for the council. Much like the county executive race and District 2, the extra-party shenanigans have made things weird. Our hot take on this is that Bud Otis has no chance to win, but could very well screw the race up for other good candidates. We’ve appreciated Bud’s votes many times in the past, but we’re not pleased to see the vista from out here. On the other hand, if Tony Chmelik would like to hand Lisa Jarosinski the District-2 seat, roll out the red carpet and be our guest–no offense to Steve McKay, with whom we find plenty of room to agree on local matters. We are also concerned, as others of our local political coterie (good info in that link from RALE’s Facebook page that you just passed) have noted alongside us, about who Bud is taking campaign contributions from. If money equals speech (and SCOTUS proclaims it so), you can see who he is listening to. And what a prize you have won! Mr. McKay is a conservative, but he seems to be shunned by the local Republican party groundlings, probably because he has integrity and class, and in case you haven’t seen what’s going on over on that side of the aisle here’s a link for you. Everyone knows third party candidates don’t work out–remember Ross Perot?–and Tony Chmelik damn well knows that. Draw your own conclusions about his motive. Here is a sample: OH NOES…the example we were set to provide was from a Local Wall Enthusiast who apparently deleted his dumb argument when confronted with how ill informed he is about stuff that happens way far away. Yippee? This is a great opportunity to note that the same fool was back and forth and up and down with some ladies disputing him in the comments, but as soon as a man told him he didn’t know what he was talking about, he tucked tail and ran, deleting the evidence of his misguided assumptions. Protip: mansplanations are not better than information. And on the subject of information, we know Billy Shreve has a history of being loosely acquainted with science. Holy moly, that old historical reference is a doozy. 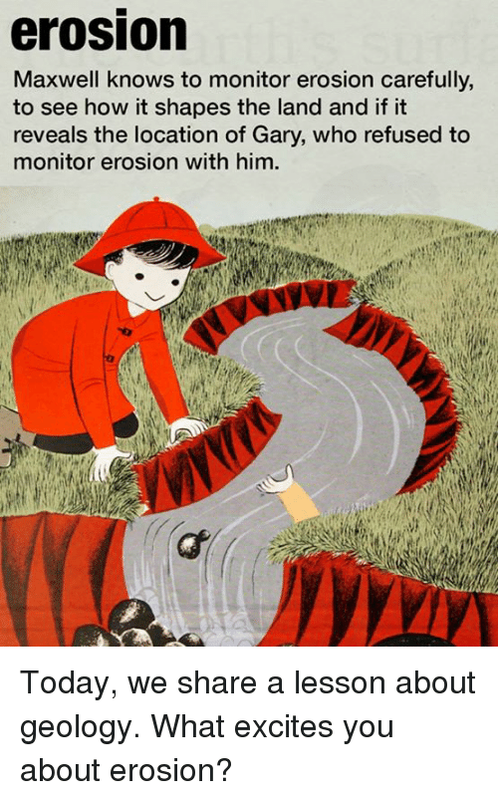 We were having a Local Yokel STEM night and discussing a science article about how the reintroduction of wolves into Yellowstone National Park has changed the river health there because now the deer stay out of the deathtraps that river valleys create for them and their population is better controlled by natural predation, so the vegetation on the river has helped to create a barrier against erosion. Apparently Yellowstone is trying to be Yellowstone and let the Grand Canyon keep doing its thing. Billy will be sad. The fact that we had all individually read or seen something about this brought us to our next point. Being ignorant is a choice, whether you are talking about eminent domain or erosion. Anywhooooo. M.C. Keegan-Ayer goes above and beyond in the name of transparency and service to the citizens who have vested interests and legitimate concerns, and who’s against that? All of the Republicans on the Council. Isn’t that a great irony? Well, actually…not so much anymore, sadly. More like par for the course. Philosophy has nothing to do with their decision making. Tribalism is the whole picture. No wonder Bud Otis disassociated from the party and has gone rogue independent maverick-like. If you will click through the link above about M.C. 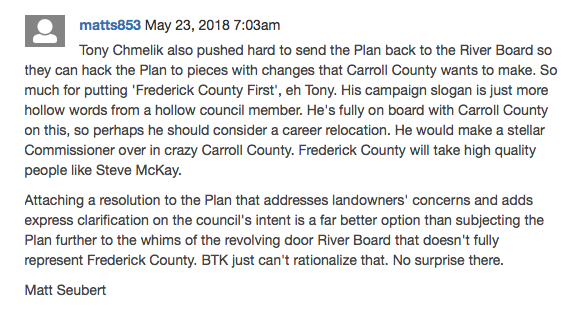 Keegan-Ayer’s resolution in the Frederick News Post, we would like to make a special mention shoutout to the astute engaged citizenry commenting on the article there. We thought “petulantly lazy” as a description of Billy Shreve perfectly addressed his conduct both yesterday and since forever. We would also like to boost one comment in particular–that of Matt Seubert, who is the current president of RALE. Well done, sir! Although we would be remiss if we didn’t say that although none of the present day coterie of LocalYokels lives in D2, we also think Lisa Jarosinski is pretty cool. She has been actively involved with RALE as well. Bipartisan chill, between her and Steve McKay. D2 could be a win-win race, if Republicans do it right in the primary. Let’s stop voting for people who don’t care about anything but causing problems and creating scenes. It will make our hobby very boring, which would be better for everyone in Frederick County. In fact, if we could do that, the whole country would be better off.